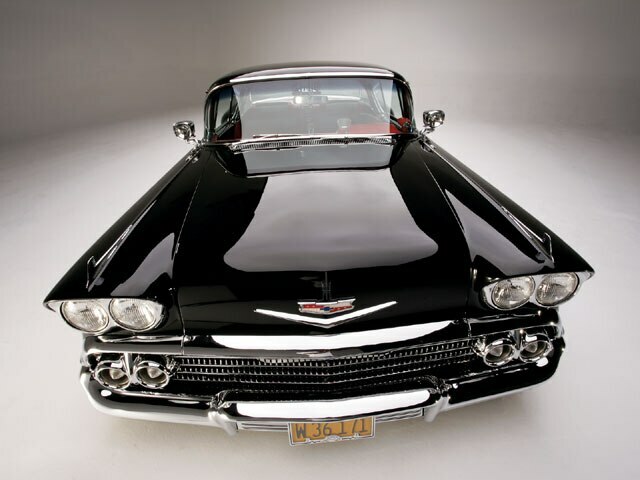 There's No Denying The Quality And Detail Found In Chris Roark's '58 Impala. 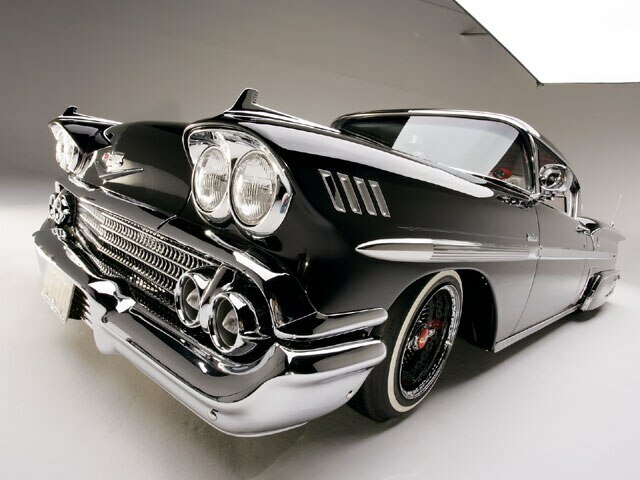 This month, we’re featuring Chris Roark’s ’58 Chevrolet Impala, “Darkside Dynasty,” from Vacaville, California. Chris’s Impala is, in general, where the lowrider industry needs to go. This immaculate Impala represents the lowrider market perfectly as it hits every point without going overboard on the overall look. The car’s detail and quality are undeniable. In fact, it’s surprising that the ’58 hasn’t yet won an Excellence award at a Lowrider Tour event, given all of the detail found on the vehicle. Oh well, it’s just a matter of time until Darkside Dynasty has its day in the sun. Chris is one of those special guys who some people would call a perfectionist. As a perfectionist, Chris took close to two years to build his first generation Impala at his shop, C&C Customs in Vacaville. The frame was taken off of the car and sent out for gloss black powdercoating covered with clear. No type of traditional body filler was used on the frame and all of the welds were smoothed and done with metalwork. 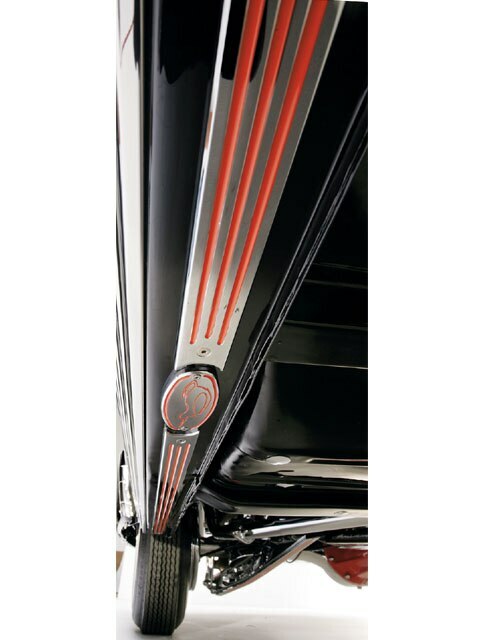 For accents, the frame has machined inserts, which are further complemented with pinstriping. The rear trailing arms were custom made and trimmed with billet machined inserts. Custom shims make sure that the tubular front end alignment was perfect. The paint job was next on the agenda. For this, the classic Impala was sent out to Manuel’s Auto Body in Vallejo, California. Manuel Angel spent hours making sure to block out the car straight to ensure that the finish would be mirror-like. He then sprayed a two-stage PPG urethane black finish. 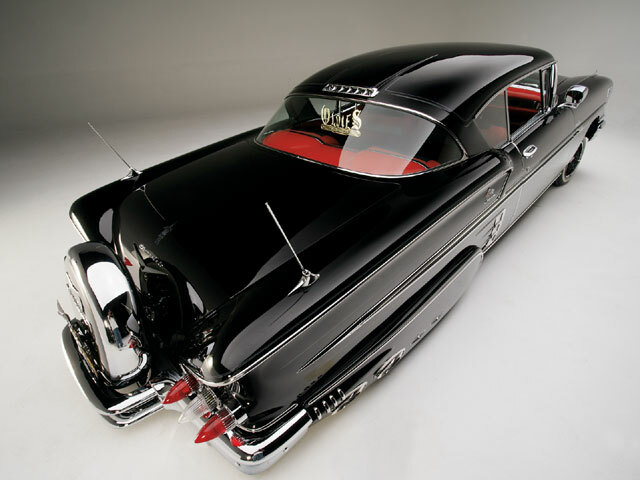 Once the car was assembled, it received pinstriping from Angelo Maisano, who did a little different style striping than he’s normally known for. For this job, he used subtle colors and light designs to accent the body lines and chrome trim (supplied by Walker’s Custom Chrome in Shasta, California). Chris took about 10 weeks on his engine compartment, making sure that everything was perfect. A ’76 Corvette engine was smoothed out and painted. An RV cam was added to have that extra lobe for increased torque and power. Zoops pulleys and brackets were used, and several custom billet pieces were included. Finishing touches on the engine include freeze plug covers with every hole covered with a custom plug. 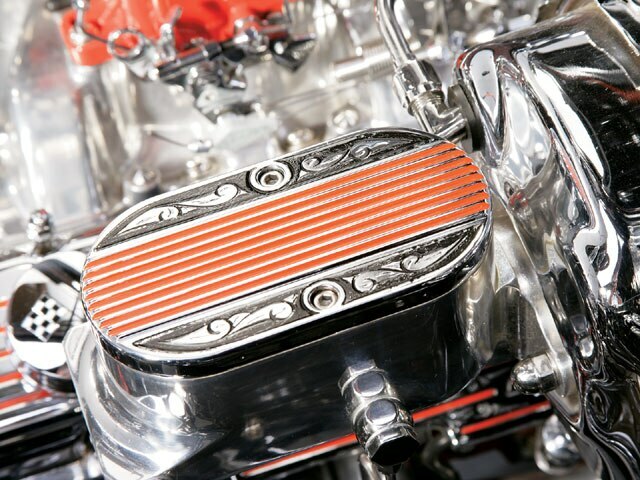 The intake was polished to accent the painted carburetor. The radiator received a bracket featuring an Impala with more than 500 machined holes to create a spiral design. Chris incorporated an SSBC aluminum master cylinder and booster to help stop the car. For a special touch, Chris added stainless steel tubing throughout the engine compartment. Chris’s idea for the hydraulic setup was to “show every component in detail; no hidden batteries, solenoids, etc. Everything’s exposed.” With the help of his business partner, Carl Hernandez (the other half of C&C Customs), Chris devised a game plan and divided the task at hand. The setup was designed in AutoCAD by draftsman Anthony “Baby Hands” Felo before it was built and installed. Apprentices Angelo “Shadow” Lopez (Chris’s nephew) lent a helping hand as did Chris Roark, Jr. and Dan Sousa. The first thing that Chris did was create a 1 11/42-inch subfloor or elevated floor to ensure that all of the hydraulic equipment would be level when he started putting it together. The hydraulics feature digital pressure gauges rated at 3,000-psi with a 3,000-psi sending unit (the first ever made by Dakota Digital). The tubing was bent and flared before any equipment was mounted in the car. The interior received a red Ciadella stock upholstery kit by Gary of ABC Upholstery in Vacaville. 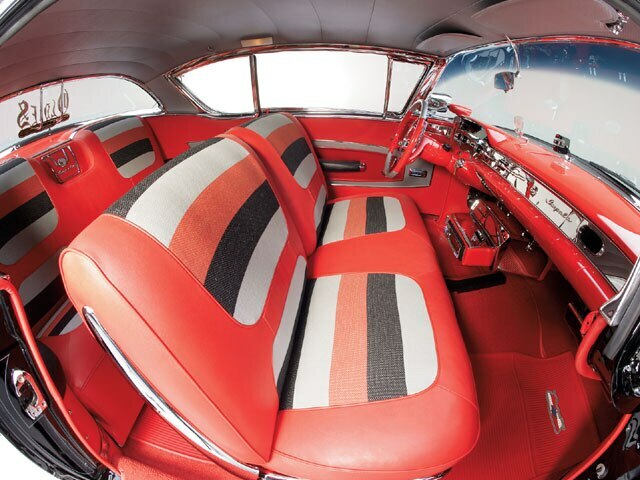 Other interior tricks include a custom dash and a ’59 Impala steering wheel that’s 211/44 inches smaller (in diameter) than the stock ’58 wheel. Chris modified the new wheel to accommodate the ’58 horn ring. A custom speaker grille was made with 1,062 11/48-inch holes. Many more details followed to set this ’58 apart from the pack. Chris estimates that 99-percent of the car’s bolt threads were covered with stainless steel acorn nuts. For Chris, visible bolt threads were unacceptable; if the threads were too long, they were cut short. All of the engraving was done by Hernan’s Custom Engraving with black shading by Carl Delgrosso for an elegant look. The 14×7 wheels were taken apart and refinished with murals done by Sammy DeLeone of Napa, California, who also did murals in the trunk and on the fender skirts. 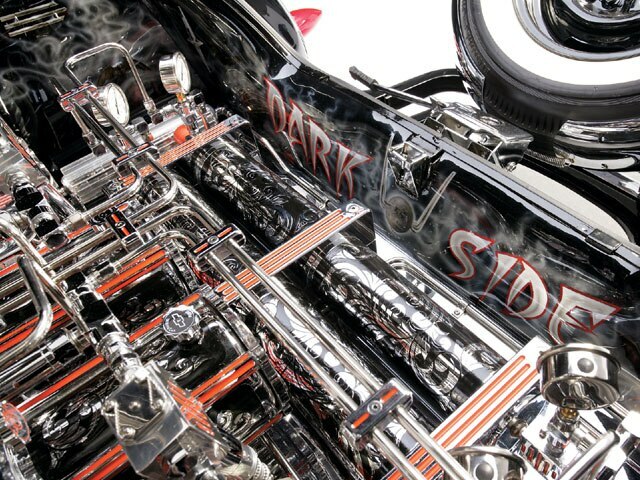 Since its completion, Darkside Dynasty has been a powerful force at lowrider shows. It’s also been invited to several NHRA shows, which is great for the lowrider industry, as it helps others recognize the Lowrider Lifestyle in a positive form. Chris would like to thank his wife, Esmeralda, daughter Elizabeth, and the newest apprentice to the C&C crew, Charles Lopez Roark, Jr. We can’t wait to see what Chris breaks out next. He did tell us about the latest creation that he’s working on, so this lowriding dynasty is likely to continue for some time. Engine/Drivetrain: Chris smoothed out and painted a ’76 Corvette engine to match the exterior, and added an RV cam for added torque and power, as well as Zoops pulleys and brackets, and custom billet parts. The intake was polished to accent the painted carburetor, and Chris added stainless steel tubing throughout the engine compartment. Body/Paint: After spending hours blocking to ensure a mirror-like finish, Manuel Angel of Manuel’s Auto Body in Vallejo, California, sprayed two-stage PPG urethane black paint. Angelo Maisano added subtle pinstriping to accent the body lines. Sammy DeLeone of Napa, California, is responsible for the discrete mural work found on the fender skirts, trunk and wheels. Interior: Gary at ABC Upholstery in Vacaville installed a red Ciadella stock upholstery kit. 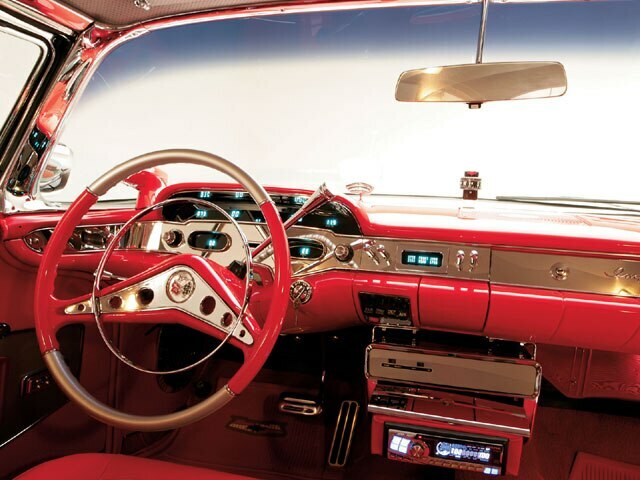 Other interior tricks include a custom dash and modified ’59 Impala steering wheel. Sound System: Chris and Kirk Knutson installed an Alpine head unit with Audiobahn amplifiers and Memphis Audio speakers. Setup: Chris and Carl Hernandez of C&C Customs designed a show setup with “everything exposed.” The setup includes two ShowTime Hydraulics pumps, four Adex dumps, four Optima batteries, bent and flared tubing, and 3,000-psi Dakota Digital pressure gauges.